Today. My left leg is a fiery red today. Especially after washing with the herbs, i wonder why! 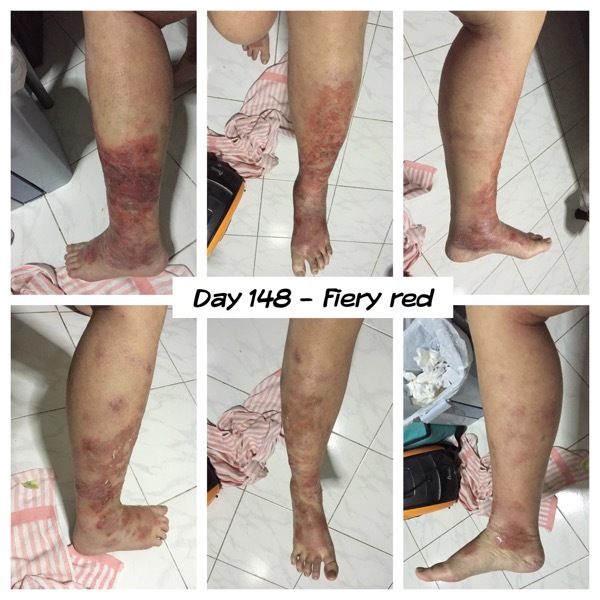 Is the greenish herb brew making my leg more red than usual? My legs has been oozing all day. Its depressing to feel it ooze. Its oozing so much that its dripping on the floor! Wtf. I have not oozed like this before, i hope it stops soon. So in the evening after washing with the herbs and its still weepy, so i finally opened my bottle of potassium permanganate to use. Wore a plastic glove and dabbed it onto my oozy feet. Not sure if it will help. Its still abit ozzy. Gah. My tcm says many have been flaring the past week, and that if i see no improvement, its not too bad. I dont know if i find that calming :S you know people when they are panicking, whatever you tell them seems to have little effect. And thats me. I know i need to keep calm and dry the ooze. For once i think i need to f-king sleep human hours. GO JO! SLEEP HUMAN HOURS! And tomorrow theres zumba. Fark! I hope i can finally attend and sweat it out properly after so long! Be positive Jo!